On Tuesday, Dec. 9, Ka‘ala Buenconsejo became the new County of Maui Parks Department Director, according to an inter-office email sent out by the department’s interim director. County Communications Director Rod Antone confirmed that Mayor Alan Arakawa had hired Buenconsejo. “We had a number of applications come in after we won the election,” Antone told me. “His application was one of many that came in.” Antone added that there were three finalists for the job, though he declined to name the other two, citing county personnel policies. The County’s Parks Department has been without a full-time director since Glenn Correa retired in June. He’d been on administrative leave since February, removed pending a Maui Police investigation of alleged corruption at the department involving golfing on county time (the department ultimately punted the investigation to the state Attorney General’s office, which refused to confirm or deny any investigation and ultimately never released any official finding). So for much of 2014, Deputy Director Savage has run the department on an “interim” basis, but her lack of administrative experience made her taking the top job all but impossible. Until this year’s election, Buenconsejo had no political experience (his most recent job was marketing director for Na Hoaloha Ekolu, the parent corporation that owns Old Lahaina Luau, Star Noodle, Aloha Mixed Plate and Leoda’s Kitchen & Pie Shop). His campaign website says he’s also worked for Kapalua Land Company as well as in banking, real estate. He has a bachelors degree in journalism from UH Manoa. 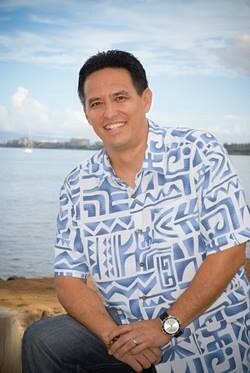 But this year, Buenconsejo ran against Maui County Councilmember Elle Cochran. Though ultimately unsuccessful (Buenconsejo lost by seven percentage points), Buenconsejo benefitted from tens of thousands of dollars in campaign spending by two Honolulu-based pro-development SuperPACs. The Maui News reported back in February that the Director’s salary is $114,770 a year.